Pencil drawing of Safidon by Robert Smith (1787-1873) dating to 1813. 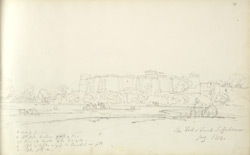 This is one of a series of 29 drawings (29 folios) of landscapes and architecture in the Punjab and Uttar Pradesh of 1812 and 1813. Inscribed on the original cover is: 'No. 4. Rewarry & Seik Country: Siharunpoor & Hurdwar. Lines of March etc. '; on the inside of the cover is: 'Drawn by Col Smith. R.E. Owner of the extensive round house at Paignton, Devon. Book of Sketches sold by auction at the above house - 4 of the books purchased by me. J. Pethwick. The Colonel was splendid as a draftsman, but the worst possible as a painter.' The drawings are inscribed with titles in pencil. Safidon is located in Haryana in the northern part of India. Legend ascribes its foundation to the destruction of the serpents ('sarpa damana', which became corrupted to Safidon) by Janamejaya, the son of Raja Parikshit to avenge the death of his father. The town was formerly quite grand as testified by what remains.